How To: limit access to Media Server (DLNA Server) to a single public folder on AirStation USB hard disk ( User Friendly Firmware). - Details of an answer | Buffalo Inc.
How To: limit access to Media Server (DLNA Server) to a single public folder on AirStation USB hard disk ( User Friendly Firmware). User-Friendly firmware on AirStation by default will mount the entire USB disk volume automatically and will enable Media server on the entire volume. To limit serving media files to a single Public Folder, follow the instructions bellow. 1- Connect USB disk to USB port on the AirStation. 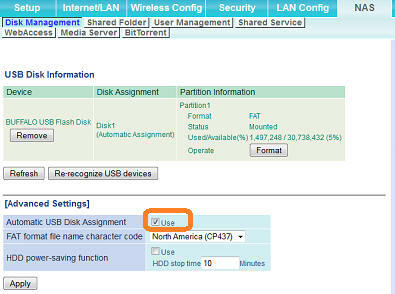 2-Navigate to NAS -> Disk Management tab and uncheck "Automatic USB Disk Assignment"
3- Click "Refresh" or "Re-recognize USB devices" . 4-Navigate to NAS -> Shared Folder. 5- From drop down list select the "Shared Folder Name"
a) To share with PC and MAC (or Samba) clients check/enable "Win/MacOS(Samba)" box . 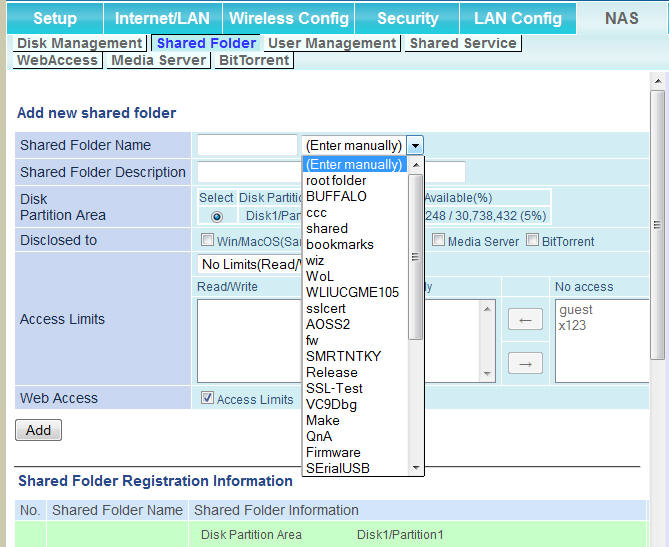 b) To access the shared folder from Internet or Browser based application check/enable "Web Access"
c) If you have Media Server (DLNA Server) enabled to specify public folder check/enable the "Media Server" box. There can only be one directory specified for media server. The supported media Files in the directory will be made public and accessible from LAN network regardless of folder Access Limit settings. d) to specify bit Torrent download directory, check/enable the "bitTorrent" box. There can only be one directory specified for bit Torrent download. 7- finally, click apply button to commit the changes. 8- Navigate to NAS | Disk Management tab. under Media Server, set the check box for Enable option . Next Click Apply. To confirm DLNA server is enabled refer to [Status] and it should indicate "Staus Enabled" .